Water is brought to your homes through thousands of kilometres of underground pipes. For various reasons, pipes can leak and some water is lost between the treatment works and your home. Water is piped under high pressure to your homes through thousands of kilometres of underground pipes. For various reasons, pipes can leak and some water is lost between the treatment works and your home. Water companies have reduced leakage by a third from the 1990s and continue to manage leakage closely. All companies have targets for the amount of water that leaks from pipes. All companies have targets for how much water leaks from pipes – are they meeting, beating or failing them? Targets differ for each company, depending on how much it costs to reduce leakage in each area and how much extra water from reducing leaking is worth – in money, to the environment and to customers. The targets are approved by the regulator, Ofwat, and set so that bills are no higher than they need to be. Because the size of areas companies supply can vary considerably, the amount of leakage in each company’s area is different. To compare companies against each other, you can either look at how much leakage there is per length of pipe – or how much leakage there is per property. Why might the leakage levels and targets vary? Targets for leakage are based on comparing the cost of getting extra water by reducing leakage and the cost of getting extra water from other sources, in each part of the country. So leakage targets, and the level of leakage, will vary depending on local costs and water availability in that region. The targets also include how important customers think reducing leakage is, and this varies across the country too. • Damage to pipes - in cities and towns, heavy traffic compresses the soil around pipes and can damage them. Have companies met their targets? The graph shows whether companies have met their targets in the latest year. If actual leakage is less than the target, the company has beaten the target and saved extra water. Why aren’t there targets for all companies on the graph? Some companies don’t have targets for every year – they have targets they have to meet by 2020 – and some companies have a different type of target: as these aren’t comparable with each other, they aren’t shown on this graph. For more information you can go to your company’s website using the link below. To compare companies of different sizes, this graph shows the volume of water leaked from each company’s pipes compared to the overall length of water pipes the company has. This graph shows performance in the latest year. To compare companies of different sizes, the graph shows the volume of water leaked from each company’s pipes compared to the number of properties the company supplies. This graph shows performance in the latest year. To compare companies of different sizes, this graph shows the volume of water leaked from each company’s pipes compared to the overall length of water pipes the company has. The graph shows how companies compare on leakage over the last three years. To compare companies of different sizes, the graph shows the volume of water leaked from each company’s pipes compared to the number of properties the company supplies. The graph shows how companies compare on leakage over the last three years. Has this information helped you understand how companies compare on leakage? Water companies take leakage extremely seriously. They spend millions every year to repair leaks and replace old pipes. There are also targets set by regulators to reduce the amount of leakage. Home owners are responsible for the maintenance of the water supply pipe that runs from the street to their property. 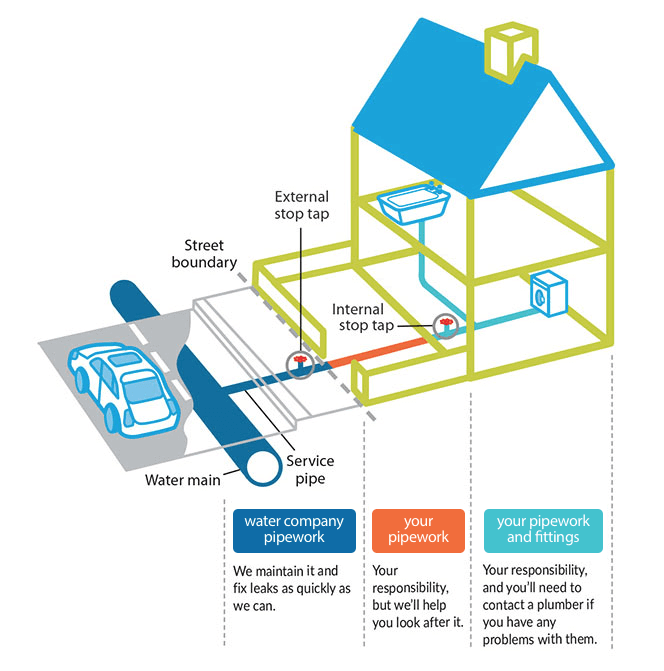 The water supply pipe is the pipe that brings water into people's homes from the water company mains pipe in the street. Home owners are responsible for the maintenance of this pipe but if this leaks, their water company may be able to repair it for them. Water pipes - which do you own? It is helpful to know which pipes are water companies' responsibility and which ones are yours. There are many reasons why water pipes leak. Some are old and have worn out through gradual corrosion, and others can get damaged by freezing weather. Ground movement, such as natural shifts in building foundations, can also put a strain on pipework. If you spot a leak on the street, the best thing to do is report it to your water company as soon as possible. If you think you may have a leak and you are on a water meter, check your meter reading to see if it is rising even when all water appliances are off (remember to wait 30 minutes to allow any cisterns to fill). If you find a leak in your pipes, contact a WaterSafe certified plumber.